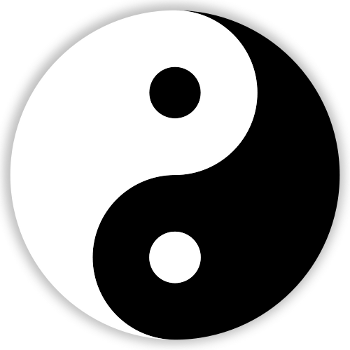 Taoism is, among other things, a philosophy that originated in China in the 3rd or 4th century BCE. It began with Lao Tzu’s writing of the Tao Te Ching and is still around today. It is a philosophy which values balance, moderation, compassion and being pliant and adaptable. There is a wealth of wisdom from the Taoist philosophy that could be applied in librarianship. Laws Create Lawbreakers (58) – “Where government stands aloof, the people open up.” Instead of constantly trying to control the behavior of your users, see what they do and create guidelines around that. Instead of setting furniture up a certain way and then moving it back when it gets out of place, see what configurations users like and allow them the freedom to make spaces their own. Instead of having strict mobile phone or food rules, recognize that as humans we need to communicate and eat. Outlining numerous strict library policies makes for a lot of broken policies, shushing, and saying no constantly. Bend, Don’t Break (76) – “When a plant becomes hard it snaps.” Libraries, especially in academia, have done things certain ways for many years. We continue purchasing print journals. We still have items on microfilm. We still tell people to turn off their mobile phones in the library. In order to not become outdated or obsolete libraries and librarians should cultivate an attitude of softness. We should examine services, collections, and policies constantly to see if they are still meeting user needs and if they are still in touch with reality. Realize When Enough is Enough (9) – “Instead of pouring in more, better stop while you can.” A key concept in Taoism is that one opposite follows another. Emptiness follows fullness. As librarians, we keep taking on new roles and offering new services without dropping other services. This is a recipe for disaster. Instead of doing a few things really well, we fall into the trap of doing a lot of things poorly. By holding onto legacy services and trying to do everything, we are in fact defeating ourselves. There is only so much energy and so many resources that we can provide. We need to think strategically about what we can drop and what is most important to our community. One way is through a great presentation that I saw at ACRL about Planned Abandonment. Be Like Water (8) – “The best are like water, bringing help to all.” Water helps all people, that’s it’s nature. Just so, we should constantly be thinking about how we can best serve others. Water also is quite adaptable. It can fit easily into any sort of container and it naturally goes with the flow. Librarians too should be able to change themselves, their services, and their resources to meet their community’s needs. They should be able to adjust along with the changes that are constantly happening in the world both technologically and socially. The Tao is typically translated as “The Way.” It’s a very nuanced concept, but at it’s core it refers to the true nature of the universe. And the point of Taoism is to live in accord with The Way. Instead of struggling against everything all the time Taoism states that humans should try to see how things actually are and live in harmony with them. This can be a very illuminating idea for libraries. Librarians need the ability to be in touch with reality and not be blind or naive. The job of a librarian does not have to be a struggle against obsolescence or a constant proving of their value to stakeholders and administrators. Instead librarians can try to understand what is actually of value to our patrons and be leading the parade instead of fighting against it. The quotes and numbers above refer to chapters/sections of the Tao Te Ching translated by Red Pine, though there are plenty of free translations available as well. So true! Especially the water part. Libraries have evolved to be more like the glacier form of water. This is not good at all. I’ve used the Tao Te Ching as my basic management manual for many years. The Mitchell translation is my favorite. Kathy, that idea of True Marketing is so interesting. I really like it. Often I think people see marketing as trying to sell people crap that they don’t need. But marketing in a more pure form, the kind you’re talking about, actually takes the users needs into account and tries to match services and resources that we offer with actual wants and needs. This seems to me like a much better way of thinking about marketing to users. Do you have any suggestions of good posts or sources of info on True Marketing? T Scott, it seems like a lot of the management and governing sections in the Tao Te Ching make a lot of sense. As opposed to controlling people, you are doing what you can to help them succeed and trying to get out of their way. I’ll have to check out the Mitchell translation. I’d imagine there would have to books about the Tao of Management too. I agree with everything except the cell phone example. Most of the world tries to limit cell phone conversations in shared spaces. Listening to one half of a conversation is very irritating. Cell phone talkers raise their voices unnecessarily. The desire to answer your phone in the Reference room and chat with your mom is not the same as taking a natural short cut across a grassy space where the path should have been in the first place. Some excellent food for thought here. I particularly like ‘Bend don’t break’ and ‘Realize enough is enough’ because I think we have a tendency to explore new opportunities/trends/technology and expand our services as a result. I don’t think we spend enough time examining what we currently do and determining whether it is worth continuing. As a result, we become mediocre at a lot of what we do, and don’t excel at anything. I wrote a blog post on using a “stop doing” list or planned abandonment earlier in the year, if you’re interested. Johanna, I definitely see your point. Loud cell phone talkers are pretty annoying. There is a stairway that people use in our library that every once in a while people go to to try to be private, but it ends up echoing to every floor. Perhaps though, we also need to think about who these people are bothering. Are they bothering staff or are they bothering other patrons. If they are bothering other patrons, sometimes they are policed by other patrons and asked to keep it down. When a patron complains to me about another patron, I then relate that to the person causing the problem. But I do not see noise as an intrinsically bad thing. It’s only bad when others feel it’s bad. In my opinion dealing with cell phone problems in a case by case basis will make everyone much happier and friendlier than a prescriptive set of rules about what you can and can’t do with your mobile phone when you’re in the library. Irritating cell phone conversations or any irritation is there for a purpose-like a pain in my body or other discomfort–to wake me up. The proper and honorable response is “Thank you”. Pingback: Do You Have The Tao In Your Toolkit? I teach in the School of Information at San Jose State University, and one of my students just posted this blog post in our discussion forum. I enjoyed reading your thoughts, and then I looked at your bio and discovered that you’re a Johnnie! I’m a Bennie, having graduated in 1993. Nice to see another library person who went to CSB/SJU! Perhaps I’ll run into you at a library conference some day.